Mo Willems, a number one New York Times best-selling author and illustrator, composes a powerful symphony of chance, discovery, persistence, and magic in this moving tale of a young girl's journey to center stage. Illustrator Amber Ren brings Willems' music to life, conducting a stunning picture-book debut. Because Mo Willems grew up writing and drawing comics-he became a writer and animator on Sesame Street (where he won six Emmy Awards). Because Mo also loved reading when he was a kid-he wanted to make books. 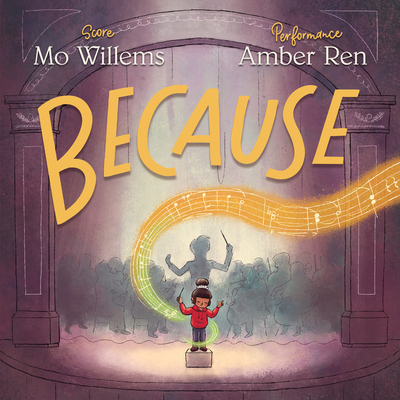 Because of many other becauses, Mo has written and illustrated over fifty children's books and has been awarded three Caldecott Honors, two Theodor Seuss Geisel Medals, and five Geisel Honors. Pigeonpresents.com has more information about Mo-just because. Because Amber Ren moved with her family (and a dream) from China to the United States when she was a teenager-she visited the Huntington Library in Los Angeles while she was in high school. Because she saw a beautiful painting by John Singer Sargent-Amber was inspired to study art. Because of many other becauses, Amber earned her BFA in Character Animation at CalArts and currently works as a visual development artist for Dreamworks TV, Warner Bros. Animation and others. This is her debut picture book. Visit amber-ren.com-because she has more to share.